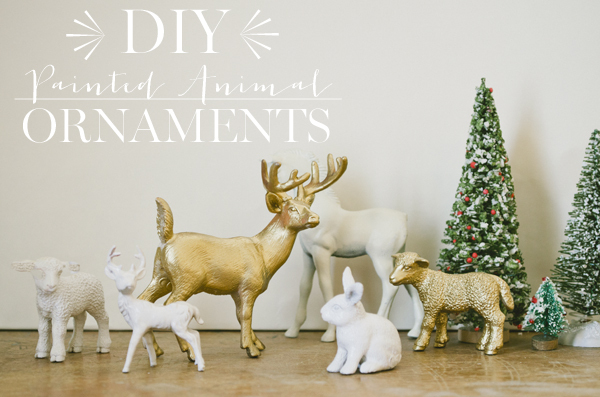 You guys, these DIY painted ornaments are my favorite. They took me all of 15 minutes to finish them, and they are just so CUTE!! Right now I (along with everyone else) am a sucker for anything with gold on it, in it, around it, affixed to it...I've fallen hard for the gilded trend. Can you blame me? I'm not a bling person when it comes to fashion, but I can't get over the glitzy home decor trend. Do you want to make these? Great! I'll show you how. I mean really, you could probably figure it out yourself, but hey....I took lots of pictures for you! - Paint. 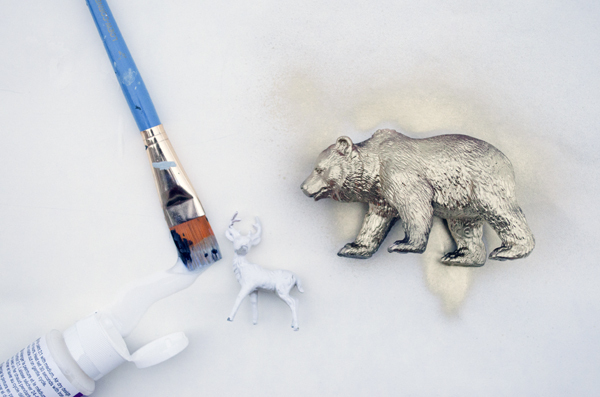 Spray paint, acrylic paint, chalkboard paint...whatever kind of paint you want to use. You just go for it. 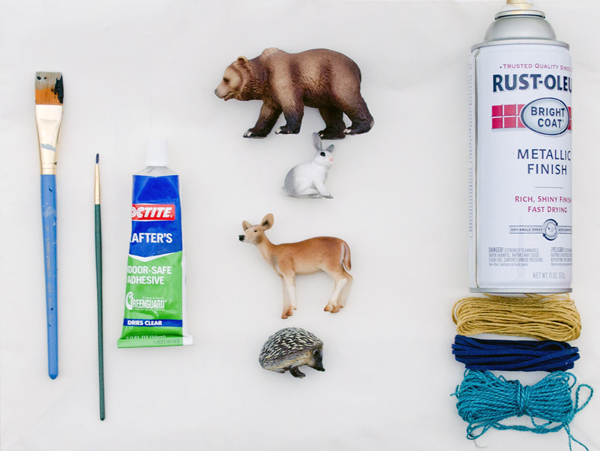 - Plastic animals! I thrifted some of these, but I found a few of them at Walmart as well. - Some sort of adhesive. I used hot glue primarily, but a few of the animals wouldn't stick very well, so I also used crafter's adhesive. - A paintbrush to get in those hard to reach places. - Any kind of twine, embroidery floss, leather strips, etc. 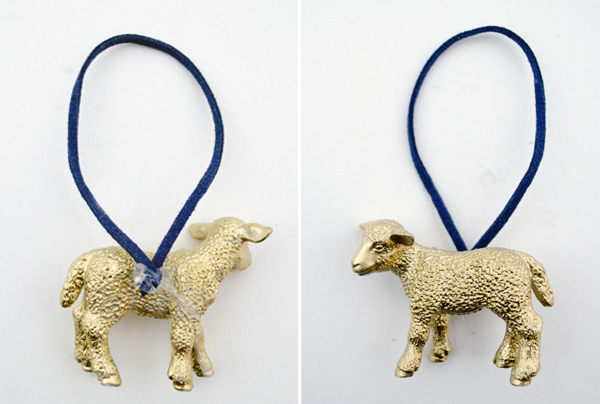 to attach to the ornament for hanging. Ok, so now that you've gathered all your supplies, start painting. I mixed it up between white and gold, of course. After they've dried, fire up your hot glue gun! I was joking with a friend today about crafting, and how I should get a tattoo of 2 hot glue guns crossed..right on my shoulder. Well, only half joking. Part of me thinks that would be kinda cool....but then I thought about needles and broke out into a cold sweat. Anyway. Cut a 2-3'' strand of your thread, twine, etc. and add a drop of hot glue to the backside of the animal. I added mine more toward the top, so it would hang straight, but play with it. You'll know where it needs to be. Let the hot glue dry, and you're done!! Seriously, how easy is that? These would make such cute gifts!! Have a wonderful weekend..we'll see you on Friday! so cute, so easy! And I love the little slideshow at the end...too cute! What a great idea!! They turned out so cute!! Adorable! I just love them! Also, a big congrats to you for the feature! love the animated GIF! when i looked at this post earlier i don't think it was working right so i was delightfully surprised when i noticed it this time! the first frame is the best! I LOVE these. So cute! Question: Where did you get those teeny tiny trees? Thanks Jenni!! I actually got an entire box of vintage Christmas ornaments and trinkets from a lady for free! these guys were in it. The one on the very far right is from Joanns though, i think! Hi! I clicked over from Folk magazines email sub. Such a cute idea! I too am a vintage junkie! On the East coast, tho. Looking forward to more great ideas!